Dark Waters is that hint of the deep. It’s the darkness of the underwater. It’s the depth of the ocean, the magic of the tide. This Premo! 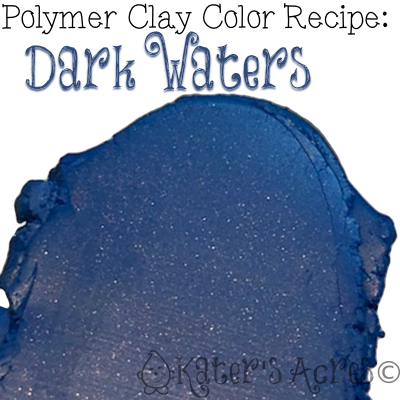 polymer clay color recipe is perfect to add depth to your summer color palettes. Last week I brought you a fabulous Mermaid Teal color recipe that really made my heart sing. I’ve used it several times since then in my studio. Today’s color is another deep and dark color. I love dark colors that I can blend into palettes that need an “almost black.” Since Polyform did away with Navy this year, colors that are dark in color are truly lacking. Making these colors myself is always a high priority. Dark Waters is one of those dark colors. In addition mica adds a depth of sparkle, which adds uniqueness to it’s profile too. Add 2 parts additional Purple for more depth. Add 2 parts additional Blue vibrant oceanic color. Add 1 part additional gold for more sparkle.